super portable combination of important roadside assistance devices. feel better having this in the car. nice fit and finish. great design. JumpSmart is a portable car jumper, and then some. It’s a three-roadside-must-haves-in-one compact device that easily stores in a glove compartment or trunk. It’s powerful enough to jump start a diesel truck and can do the job on a variety of engines all the way down to a lawn mower. And it has integrated safety features to make sure you’re correctly charging any vehicle, like alerts indicating an improper connection. 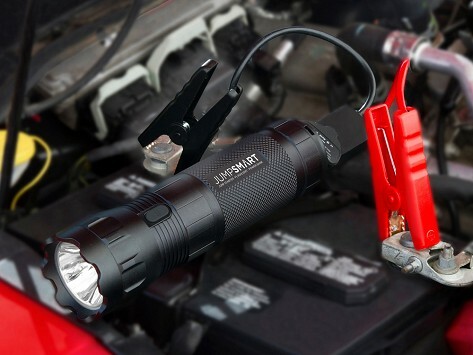 The LED light serves as a torch or emergency beacon and has four modes, including SOS, while the USB charger can provide a quick battery boost to a mobile device. All that charging, engine-jumping, and visibility-increasing power is combined in a handheld device that packs away neatly in its case. It’s the perfect added safety measure to keep in the car.